Preparing for winter can be exhausting. Whether we are prepping our lawns, winterizing sprinklers, storing outside furniture, or getting our vehicle in for maintenance, the tasks can be taxing. While every task takes some time, we wanted to touch on the importance of proper winterization of a specific vehicle – your motorcycle. 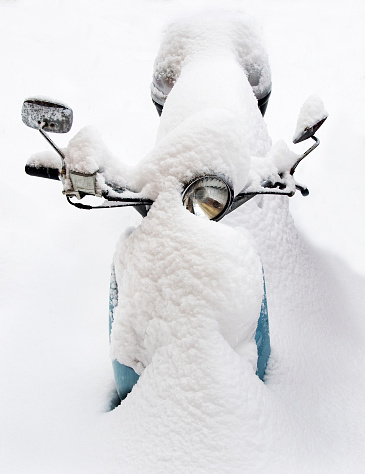 Storage: if you can store your motorcycle in a heated indoor area, we highly suggest it! By doing so, you can avoid rust and moisture build up from the blistery weather. In addition, by parking the bike on its center-stand, you can keep most of the bike’s weight off the wheels. This will help prevent flat spots from developing as well. Have a full tank of gas before storing. Utilize a fuel stabilizer: add the correct amount of fuel stabilizer for your bike, start the motorcycle and let it cycle through. Solids or gels form when gasoline goes stale; this can damage your engine in the long run. Oil and oil filter maintenance is a must. Check the air filter. Replace if necessary. Check the brake pads, tires, belts and chains for wear and tear. Battery Care: take the battery out, top the cells off with distilled water and store it in a dry place (room temperature is preferred). Protect your motorcycle with a cover to combat moisture. And of course, enjoy one last ride! That may seem like a lot, but guess what? You aren’t done after that checklist. Make sure you are starting your motorcycle up every 2 weeks to keep those fluids moving through the engine. Motorcycle safety is important and the maintenance of your vehicle coincides with these safety measures. If you have further questions regarding your motorcycle, visit a motorcycle specialist and they can offer you more detailed advice.